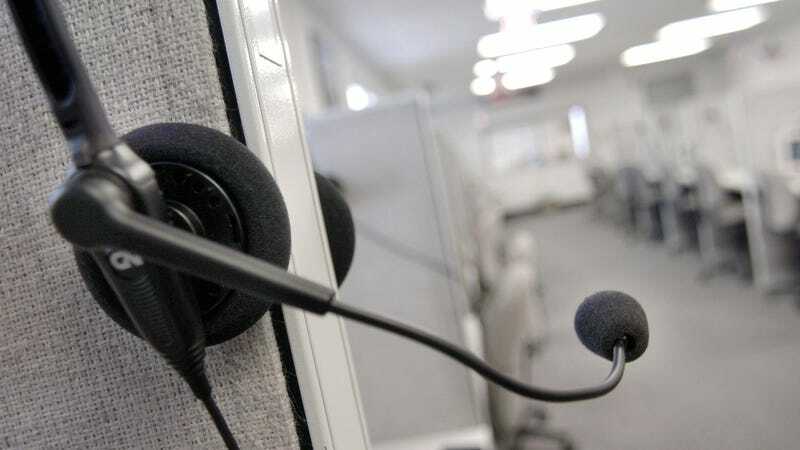 A headset hangs on a cubical wall after the last telemarketing shift at Spectrum Marketing Services, Inc. September 26, 2003 in Philadelphia, Pennsylvania. The robocall problem is as bad as it has ever been, but if big corporations have their way, it just might get worse. The Washington Post reported this week that top businesses from the financial services and retail industry, among others, are lobbying the Trump administration to make it easier to send calls and texts en masse. Per the Post, companies like Capital One, student loan servicer Navient, Sirius XM, and a number of business interest groups have all been on the front-line of the fight, pushing to make sure any crackdown designed to cut back on spam calls won’t hurt their own automated systems. Not that you need to be told—your phone is probably ringing with a bot on the other line right now—but robocalls have become the scourge of every cellphone owner. YouMail’s RoboCall Index estimates that 4.1 billion robocalls were placed to people in the US in June—an average of 12.7 calls received per person. That’s the worst month on record, and the fourth month in a row when a new record high has been set. While some of those come from scammers who abuse automated systems—people like Adrian Abramovich, who the FCC fined $120 million for placing 96 million unsolicited calls in just three months offering fake travel deals—most robocalls come from legitimate businesses. According to the Post, about three-quarters of the more than four billion robocalls placed in June were telemarketing calls and alerts from companies that consumers have a relationship with. The fact is, companies do use robocalls as a way to contact consumers and sometimes they’re actually useful. Automated calls alerting a person that their prescription is available to pick up, for example, seems like a valid use of the technology—as long as the customer actually consented to the call and the services aren’t abused. That has businesses pushing to make sure whatever action is taken to address robocalls won’t hurt them. Per the Post, the US Chamber of Commerce has pushed back against the idea of adding any federal rules that would heavily restrict how businesses can communicate with customers. Problem is, businesses are just as guilty of abusing automated systems as anyone. Navient, one of the leaders in lobbying for loosening restrictions on robocalls, has regularly been accused of harassing consumers with automated calls. Navient has been hit with multiple lawsuits over robocalls, and last year consumer groups asked the Federal Communications Commission to look into the company’s practices. The student loan servicer isn’t alone in getting hit with legal complaints for harassing behavior. Hyundai was subject to a class action lawsuit over robocalls. Companies including Cash Fund, Time Warner, Charter, Dish Network, and loads of other companies. The last time the FCC tried to implement rules aimed at cutting back on robocalls, they got challenged in court by a trade association of debt collectors and shot down. It’s back to the drawing board, but with businesses whispering in the ear of an agency already happy to do the bidding of big corporations, expect that your phone won’t stop ringing any time soon.